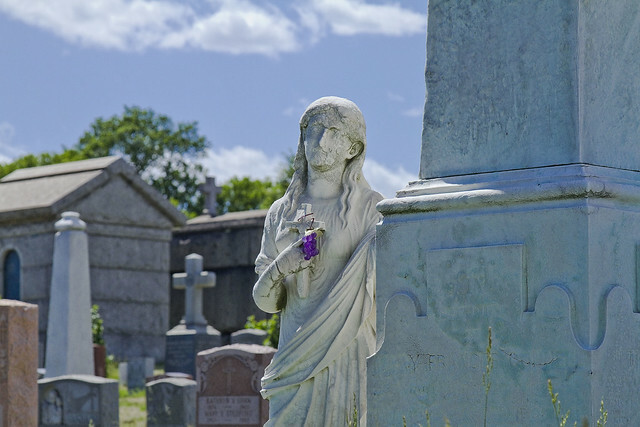 Saturday – Calvary Cemetery awaits. At 12 p.m. on this coming Saturday, I’ll be narrating (humbly) a walking tour of First Calvary Cemetery here in LIC’s Blissville neighborhood. I will be at the northeast corner of Greenpoint and Review Avenues at 11:30 a.m. As long time readers of this, your Newtown Pentacle, will tell you – I have a special love for Calvary. 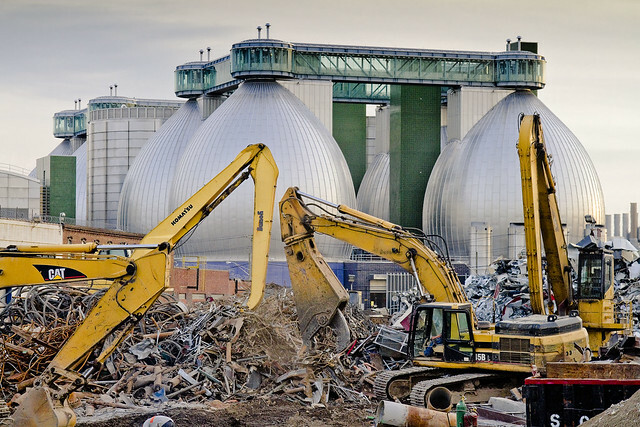 It’s the largest chunk of “green infrastructure” found along the Newtown Creek as well as serving as the final resting place of literally millions of Roman Catholic New Yorkers. 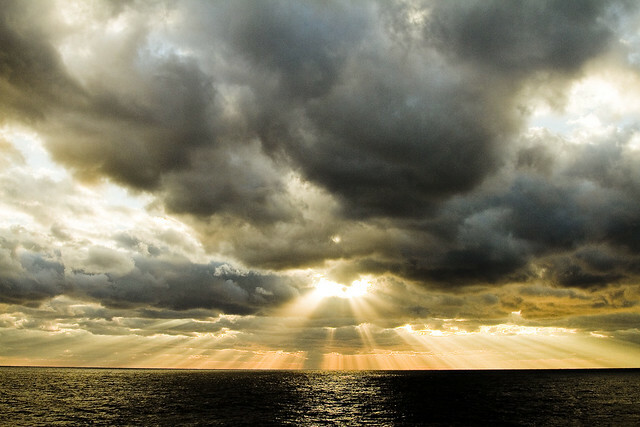 It’s part of the firmament of LIC, and a significant touchstone for the history of 19th century NYC. Expect to encounter unexpected life forms in Calvary. The cemetery lies along the migration routes of several bird species, and I’ve spotted everything from Canada Geese to Great Blue Herons and Red Tail Hawks there. 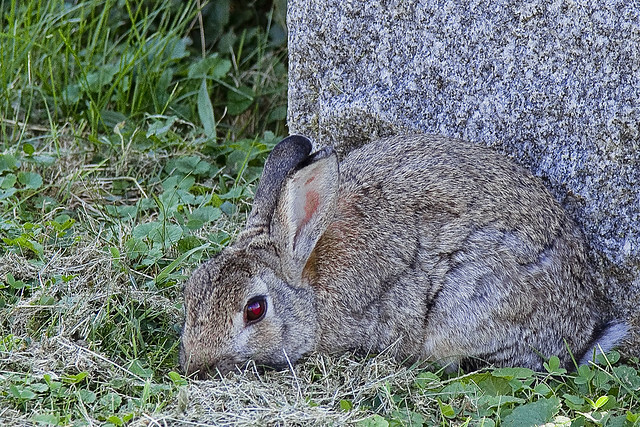 On, and in, the ground there’s a plethora of critters – such as the small rabbits which the Irish of the 19th century would have referred to as “Coney’s.” No guarantee on what we will spot, but there’ll be something interesting. Sculptural monuments are found everywhere in First Calvary, from thirty foot high obelisks to enormous mausolea. We will be visiting the final resting place of Governors, Senators, even the tomb of the original gangster himself – Joseph Masseria. The rightful King of Ireland is buried in Calvary, along with members of Corcoran’s Legion – the Fighting 69th. For NYC history fans, and tapophiles – this place is a smorgasbord of interest. The walking tour will be roughly two hours long, and will range over several shallow hills which host a natural grass surface. A hat or parasol is highly recommended to shield yourself from the sun. The walk is not difficult, but if you suffer from mobility issues – this likely is not the tour for you. 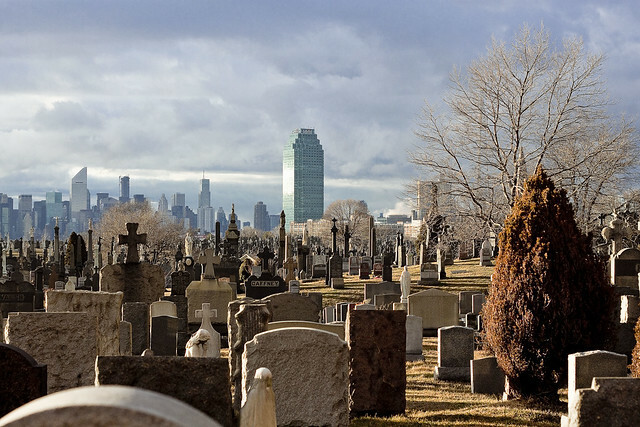 Surrounding Calvary Cemetery are the concrete devastations of Western Queens – and the heavy industrial zone which forms the northern shoreline of the Newtown Creek. 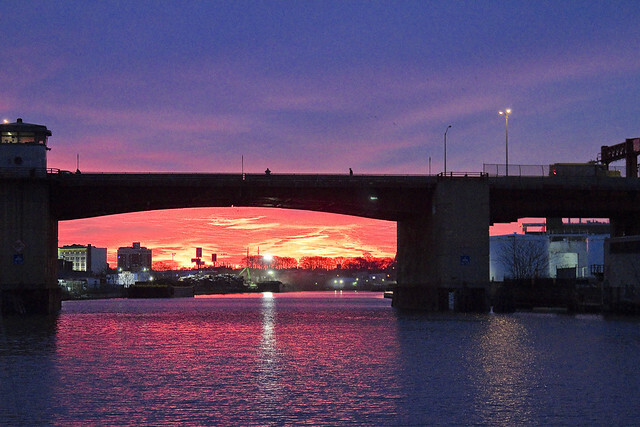 We will have a unrivaled view of the ongoing Kosciuszko Bridge construction project, btw. 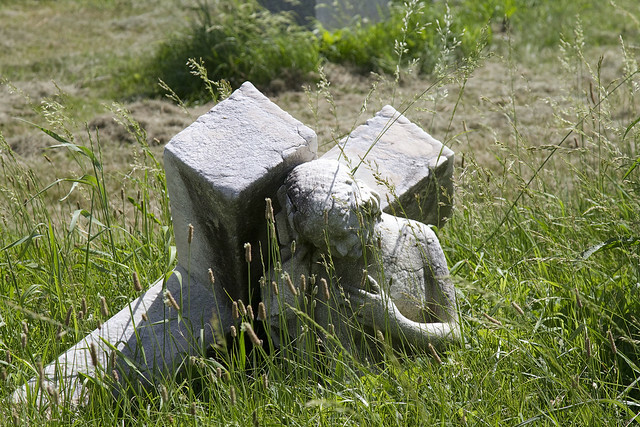 Bring your camera along, as Calvary Cemetery is a jewel. 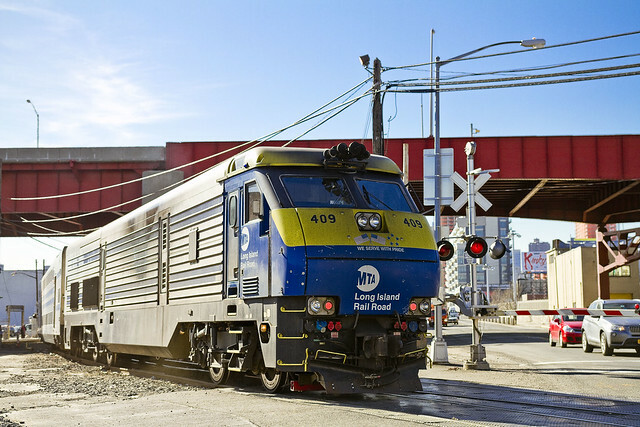 The Manhattan skyline is omnipresent, providing for impossibly candid views of an area stretching from the Williamsburg Bridge to the Queensboro. During the era of the so called “Gangs of New York” there was a saying which went “All roads lead to Calvary” and the cemetery was once a major destination for the Catholic masses of tenement Manhattan. Surrounding the great burying ground were saloons and road houses that serviced mourners. After the tour concludes, we will be visiting the last of these road houses (bar and food not included in ticket price, btw, just a post tour hang out). One other thing to mention, obviously, is that if there’s a funeral underway we are going to steer clear of it out of respect and deference for the mourners. Hope to see you Saturday morning, at the corner of Greenpoint and Review Avenue, at 12 p.m. 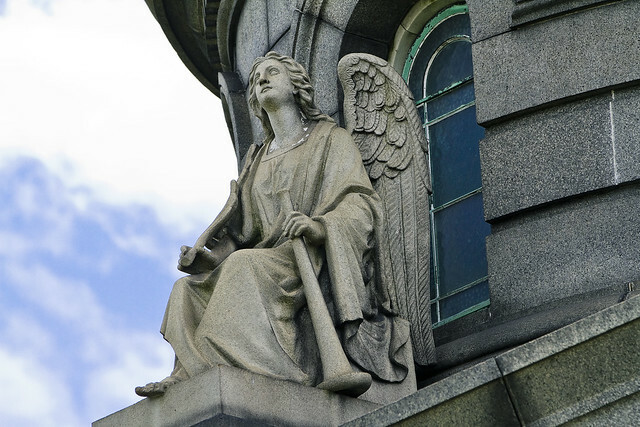 Tomorrow – Calvary Cemetery awaits. At 11 a.m. tomorrow, I’ll be narrating (humbly) a walking tour of First Calvary Cemetery here in LIC’s Blissville neighborhood. I will be at the northeast corner of Greenpoint and Review Avenues at 10:30 a.m. As long time readers of this, your Newtown Pentacle, will tell you – I have a special love for Calvary. The walking tour will be roughly two hours long, and will range over several shallow hills which host a natural grass surface. A hat or parasol is highly recommended to shield yourself from the sun. The walk is not difficult, but if you suffer from mobility issues – this likely is not the tour for you. 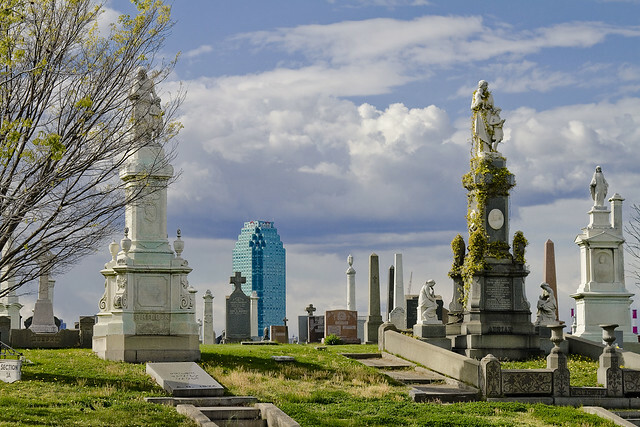 Surrounding Calvary Cemetery are the concrete devastations of Western Queens – and the heavy industrial zone which forms the northern shoreline of the Newtown Creek. 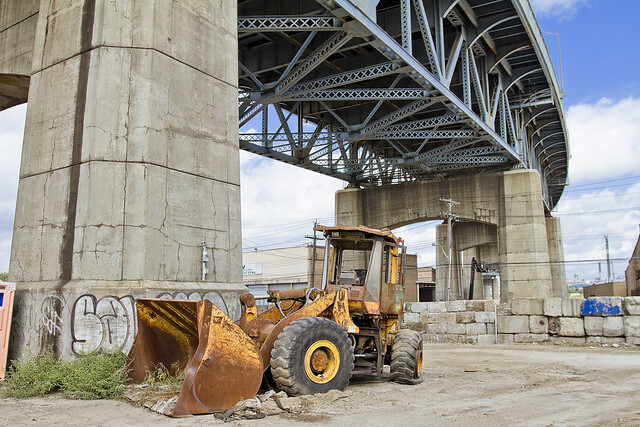 We will have a unrivalled view of the ongoing Kosciuszko Bridge construction project, btw. Hope to see you tomorrow morning, at the corner of Greenpoint and Review Avenue, at 11 a.m.
Get on the boat, for #superfun with the Working Harbor Committee. 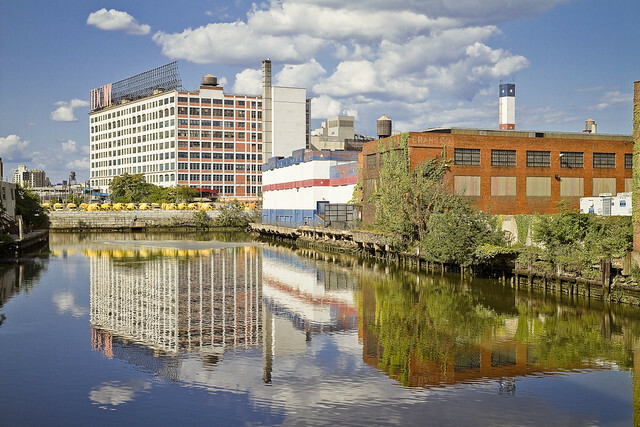 On May 31, I’ll be narrating on a boat tour of Newtown Creek for the Working Harbor Committee. WHC is offering a special $30 ticket price, discounted to $25 for seniors. It’s a two hour tour which will leave from Pier 11 in Manhattan at 11 a.m. I’m anticipating having a couple of other guest speakers onboard, but that’s still firming up. 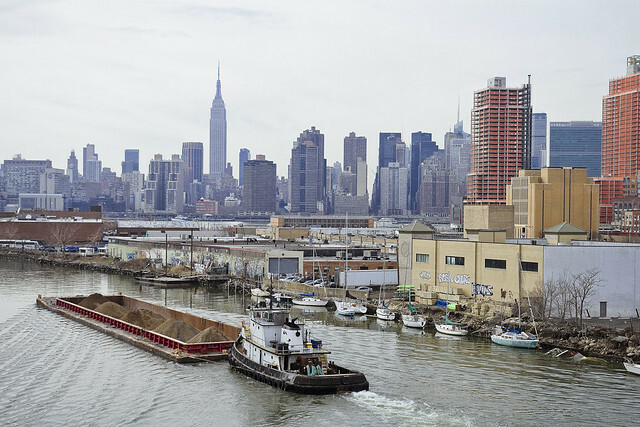 The Maritime History of Newtown Creek is one largely forgotten in these decadent times, but even now an odd tugboat and barge might be spied making their way down the waterway on any given day. 19th century Property owners were considered to have been blessed by some of the finest industrial bulkheads in the world, yet many of the businesses based along the Creek today ignore this invaluable resource, allowing their waterfront property to decay and decline. Along these bulkheads, great fortunes have risen. Amongst others- Peter Cooper (BO Railroad, Canton Iron, and Cooper Union), Charles Pratt (Astral Oil, Standard Oil, and Pratt University), and ultimately John D. Rockefeller (Standard Oil) – all grew richer than the dreams of avarice in this place. Alongside them, the darkest mills of the industrial revolution- rendering plants, yeast distilleries, bone blackers, and acid factories provided tens of thousands of jobs to the immigrant populations of Brooklyn and Queens. 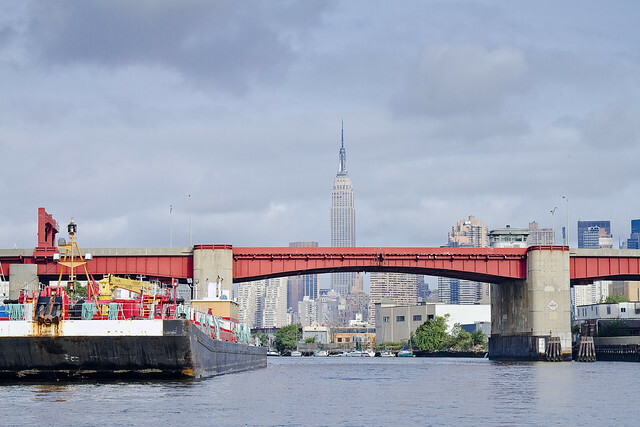 Today – National Grid, BP, Amoco, ExxonMobil, and a host of other multinational companies still maintain an enormous investment in this valuable industrial canal at the very center of New York City. Vast operations will be witnessed by those onboard, many of which are involved in the scrap metal and recyclables trade. 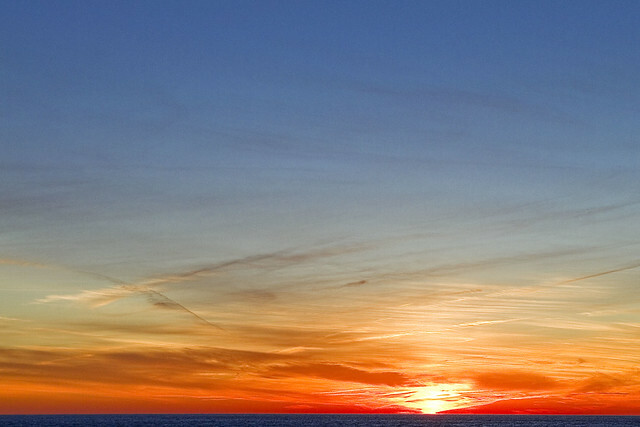 Responsible for an enormous amount of cross harbor shipping, companies such as SimsMetal are heavily reliant on the maritime trades for their economic success. This is also the the birthplace of Mobil Oil, and was the home base in NYC for the Standard Oil Company. 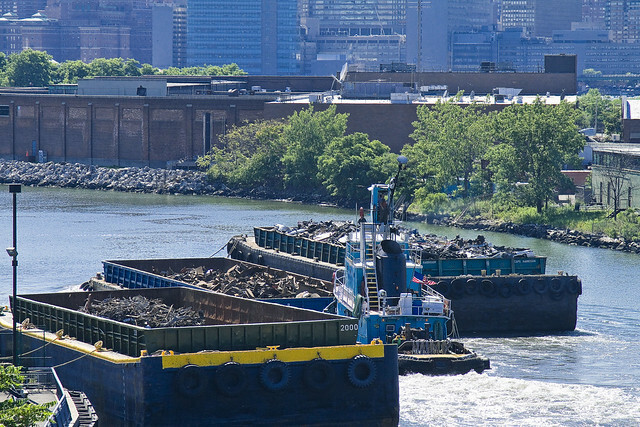 Not all that long ago, Newtown Creek carried a greater tonnage of cargo than the entire Mississippi River. 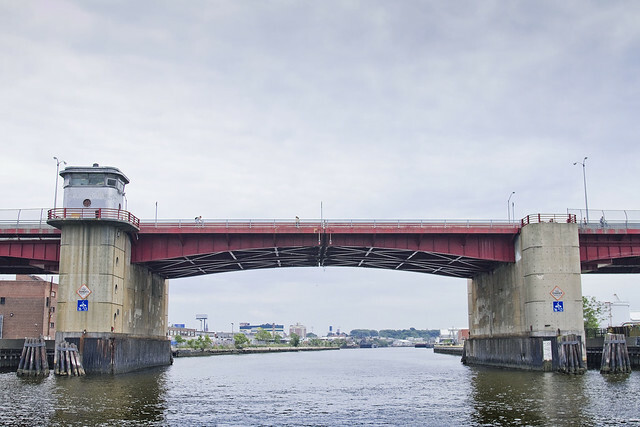 A tributary of the estuarine East River, Newtown Creek extends some 3.8 miles from its junction with the more familiar waterway, and provides demarcation for the currently undefended border of much of Brooklyn and Queens. Named to the Federal Superfund list in 2010, the Creek suffers from a centuries long history of environmental degradation and municipal neglect. 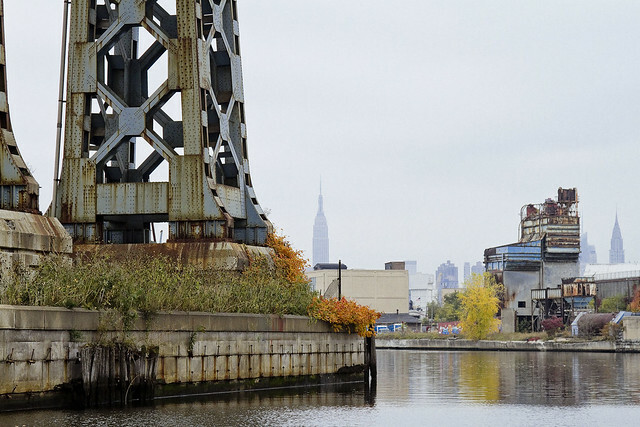 An era of great change is upon the Newtown Creek, and this trip will be one of your last chances to be exposed to it in its current form. This is actually a Newtown Pentacle post, sorry for the spam this morning. Not sure how, as my passwords etc. were still secure when I checked, but at 8:24 this morning – a spam posting propagated out from this site. First time in better than 5 years that there’s been a breech, but security protocols (changing passwords, mainly) have been invoked. Sorry for the spam, however, but… y’know, hackers and spam bots are clever. The offending post has been removed from the Twitter, Facebook, and Tumblr feeds, but there’s nothing I can do about the emailed subscriber feed so please delete it without clicking on the links. Believe me when I tell you, the last thing I wanted to deal with before finishing my coffee was this. Your humble narrator is preparing for quite a busy weekend, after all. On Saturday, I’ll be leading an excursion with the Atlas Obscura folks in Long Island City. 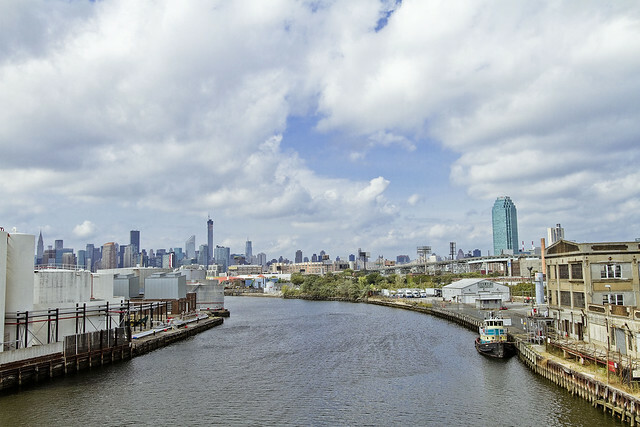 13 Steps around Dutch Kills will explore the Queens tributary of Newtown Creek and wind up over in Brooklyn. We’re meeting at the corner of Jackson Avenue and 23rd street at 11 a.m. and the walk will be around three hours or so. There’s lots of great stuff to take pictures of, and the route will carry us along one of my favorite paths. Advance tix are recommended, click here for the link, but walkups are also very welcome if you’re a last minute sort of lord or lady. The tour will set you back $20, and as it’s the last Dutch Kills walk of 2014, come with? On Sunday, the tour will be in DUKBO – Down Under the Kosciuszko Bridge Onramp – a part of brooklyn which I fondly refer to as “the Poison Cauldron.” This is likely the second to last time EVER that this tour will happen, as the coming bridge project is going to tear most of this area down. I was there last weekend and most of the businesses are gone, leaving behind a post industrial moonscape. 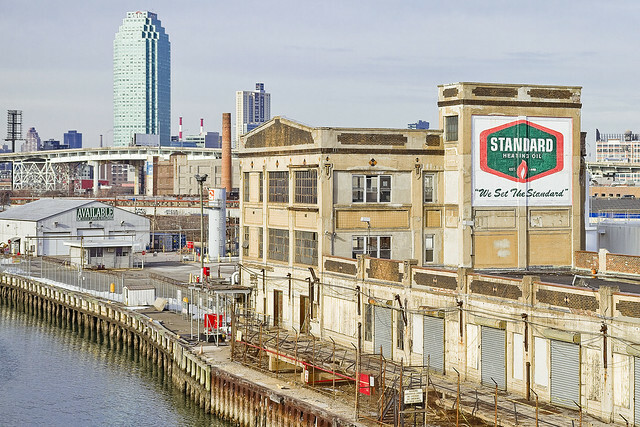 We’ll be walking through petroleum country at the beginning, and I’ll be telling the story of Standard Oil and the Greenpoint Oil Spill along the path. Seriously, if you’ve been putting off coming on one of these, do it now. 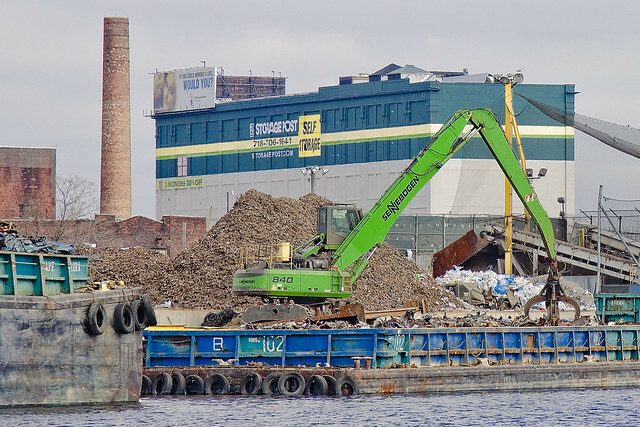 The Poison Cauldron of the Newtown Creek will soon be a construction zone, which will preclude exploration. This tour is being produced by the good folks from Brooklyn Brainery, whose ticketing page is found here. Walkups are very welcome, we’ll be at the corner of Kingsland and Norman Avenues in Greenpoint at 10 a.m. The tour will set you back $25.